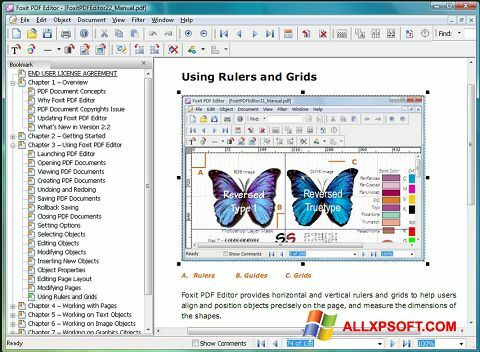 Foxit Advanced PDF Editor for Windows XP - a handy reader designed to work with PDF files. Using its functions, users can open and edit PDF files, convert data and add new information to ready documents. The program is equipped with a large set of fonts and styles that help make the text more harmonious and readable. The zoom feature allows you to increase the size of the page, or its individual sections, from 100 to 400%. Thanks to the preview option, there is no need for mandatory opening of files. You can free download Foxit Advanced PDF Editor official latest version for Windows XP in English.